Not to be confused with Madison Street (Manhattan). For other uses, see Madison Avenue (disambiguation). Madison Avenue was not part of the original Manhattan street grid established in the Commissioners' Plan of 1811, and was carved between Park Avenue (formerly Fourth) and Fifth Avenue in 1836, due to the effort of lawyer and real estate developer Samuel B. Ruggles who had previously purchased and developed New York's Gramercy Park in 1831, who was in part responsible for the development of Union Square, and who also named Lexington Avenue. Since the 1920s, the street's name has been metonymous with the American advertising industry. Therefore, the term "Madison Avenue" refers specifically to the agencies and methodology of advertising. "Madison Avenue techniques" refers, according to William Safire, to the "gimmicky, slick use of the communications media to play on emotions." In recent decades, many agencies have left Madison Avenue, with some moving further downtown and others moving west. The continued presence of large agencies in the city makes New York the third largest job market per capita in the U.S., in 2016 according to a study by marketing recruitment firm MarketPro. Today, several agencies are still located in the old business cluster on Madison Avenue, including StrawberryFrog, TBWA Worldwide, Organic, Inc., and DDB Worldwide. However, the term is still used to describe the agency business as a whole and large, New York–based agencies in particular. Retail brands with locations on Madison Avenue include: Alexander McQueen, Hermès, Tom Ford, Céline, Proenza Schouler, Lanvin, Valentino, Stuart Weitzman, Damiani, Emporio Armani, Prada, Chloé, Roberto Cavalli, Davidoff, Dolce & Gabbana, Gucci, Calvin Klein, Cartier, Christian Louboutin, La Perla, Jimmy Choo, Jacadi, Mulberry, Victoria's Secret, Barneys New York, Coach, Emanuel Ungaro, Giorgio Armani, Oliver Peoples, Vera Wang, Anne Fontaine, Baccarat, Carolina Herrera, Ralph Lauren and others. Madison Avenue is served by the M1, M2, M3, M4 and Q32 local New York City Transit buses; the BxM3, BxM4, BxM6, BxM7, BxM8, BxM9, BxM10, BxM11, BxM18, QM21, SIM4C, SIM6, SIM6X, SIM8, SIM8X, SIM22, SIM23, SIM24, SIM25, SIM26, SIM30, SIM31, X63, X64 and X68 express New York City Transit buses; and the BxM4C express Bee Line bus. These buses use a double exclusive bus lane between 42nd and 59th Streets, which comprise the only exclusive bus lane along the avenue. Although no New York City Subway stations are named after Madison Avenue, the Fifth Avenue/53rd Street station on the E and ​M trains has an entrance on Madison Avenue. Pursuant to Section 4-12(m) of the New York City Traffic Rules, driving a vehicle other than a bus in the bus lane on Madison Avenue to turn right during the restricted hours specified by sign between 42nd Street and 59th Street is prohibited, then permitted at 60th Street, but a taxicab carrying a passenger may use the bus lane to turn right at 46th Street. Bikes are excluded from this prohibition. 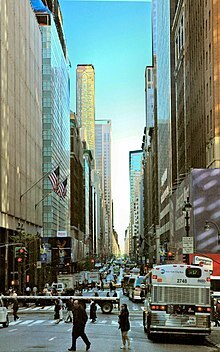 Wikimedia Commons has media related to Madison Avenue. ^ Google (September 12, 2015). "Madison Avenue" (Map). Google Maps. Google. Retrieved September 12, 2015. ^ a b c d "Advertising Ephemera Collection - Database #A0160". Emergence of Advertising On-Line Project. Advertising & Marketing History, John W. Hartman Center for Sales, David M. Rubenstein Rare Book & Manuscript Library, Duke University. 1997. Retrieved October 2, 2012. ^ Rothenberg, Randall (February 2, 1989). "Madison Ave. Quits Madison Ave". The New York Times. ^ "The 10 Hottest Job Markets for Digital Marketing Careers Right Now". August 16, 2016. Retrieved August 17, 2016. ^ "Bus Lanes in New York City" (PDF). nyc.gov. New York City Department of Transportation. Retrieved April 4, 2016.